Each year, our March issue shines a spotlight on 10 dedicated and deserving dietitians for their work and service within dietetics. The TD10 are professionals who have been nominated by the readers of Today's Dietitian — fellow nutrition professionals. 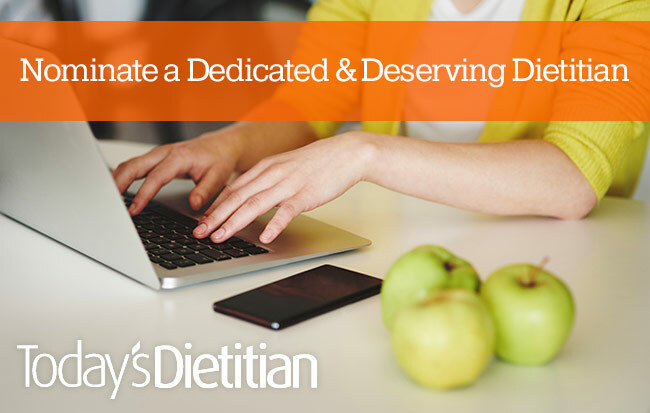 Once again, we're asking you to let us know about dietitians you believe exemplify the profession and are making a difference for their clients, their communities, and for the field of dietetics. Who should you nominate this year? RDs who have gone above and beyond their job description to make a real difference in the lives of their clients or in their community. RDs who have overcome significant challenges in their career and risen to new heights of success and influence. RDs who have achieved a high standard of excellence as nutrition professionals. RDs who have brought innovation, creativity, or new ideas to the profession. Click Here to Nominate a Dedicated & Deserving Dietitian!